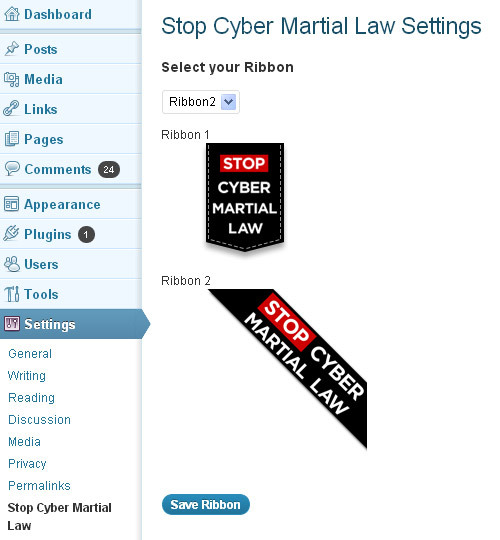 Want to add Stop Cyber Martial Law Ribbon in your WordPress powered site? Here, I created a WordPress plugin that will place a black ribbon image with the words “Stop Cyber Martial Law” on the top right corner of your website, linking to the Philippine Internet Freedom Alliance website. As you may have noticed, I joined the protest against the Cyber Martial Law by adding a small protest ribbon on this website. I’m against the online libel provision that threatens Internet Freedom in Republic Act No. 10175. I made this ribbon into a plugin so others could use it too. 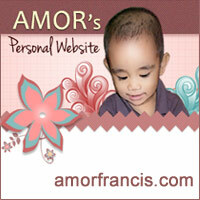 If you want to use this plugin, just download it and upload via the WordPress Install plugin upload tab, then activate. The default Ribbon is the same ribbon I’m using in this site. You may choose Ribbon 2 in the Settings as seen in the screenshot below. Di kaya makasuhan tayo since nakikisimpatiya sa mga against sa ‘anti-cybercrime law’? I don’t think so. Sobra sobrang pagsupil naman yun sa freedom of expression. Nalilito ako, law din ba yung anti-cybercrime? Dalawa pala, cybercrime law at anti-cybercrime law? Sana maliwanagan ang isip ng gumawa ng law na ito. Parang nawawalan tuloy ng kabuluhan ang Internet. Isa lang naman, yung Republic Act No. 10175 or the Cybercrime Prevention Act of 2012. Anti-cybercrime law, or law against the cybercrime, mejo nalito din yata ako sa sinabi ko hehe. Thanks Rene for visiting and commenting. OO nga buti may TRO na. At dapat lang, para mapag isipan nilang mabuti. I think this cybercrime law has pros and cons. I only hope that the real intentions of those who recommended it is not for personal gain and will help Philippines eventually in the end. I don’t know just hoping. Anyway nice plugin you got there. Hello Mike. Thanks for dropping by. Glad that The Supreme Court suspended the law for four months while the pros and cons are being studied.